The E-Learning Unit is piloting an approach to assist you in the process of designing or redesigning your new and existing modules. 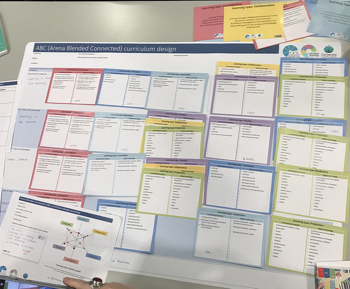 Designed by UCL academic development staff to support their most recent teaching and learning strategy, the ‘ABC Curriculum Design’ approach has been adopted by many universities as a method to design or update modules to be modern and innovative by design. The approach uses a rapid design approach which focuses on student activity and has been proven to be an effective methodology for blended course design. You can read more about the ‘ABC’ approach and its efficacy here. The approach comprises attending a 90 minute workshop in which course content is ‘storyboarded’ to sequence blended content and learning activities relative to the course’s learning outcomes. The outcome of the workshop is a skeleton course design and structure that can be used as the basis for creating a new module or transforming your existing module. The E-Learning Unit will run these workshops in the coming months and will be available to any individuals or groups who are interested in attending. To go a step further and put these designs into practice, the E-Learning Unit will be providing resourcing to assist participants in creating or revisiting course materials and content. We will ask for applications from workshop attendees and then allocate funding to chosen applicants for an E-Learning Assistant to meet their needs so that they can deliver innovative blended teaching in the next academic year of 2019/20. We hope that this new initiative will support staff to try out some new ideas and modes of delivery in their teaching which they may not have had the time, know-how or resources to do before. Please get in touch with us at elearning@qmul.ac.uk to express your interest or for further information.